Wang, J., Zhang, X., Li, L., Cheng, K., Zheng, J., Zheng, J., Shen, M., Liu, X. and Pan, G. 2016. Changes in micronutrient availability and plant uptake under simulated climate change in winter wheat field. Journal of Soils and Sediments 16: 2666-2675. Introducing their work, Wang et al. (2016) write that it is "unclear how the changes in plant growth under CO2 enrichment and/or warming affect the availability of soil micronutrients and their accessibility to plant uptake." And, therefore, the nine Chinese scientists decided to conduct an experiment to find out for themselves. As they describe it, their study "was conducted in an open field experiment with CO2 enrichment and plant canopy warming," and performed in such a way that it consisted of four treatments. These were "free-air CO2 enrichment up to 500 ppm (CE); canopy warming by plus 2°C (WA); CO2 enrichment combined with canopy warming (CW), and ambient condition as control." And what did this experiment reveal? Wang et al. report that "both CO2 enrichment and warming increased the availability of most soil micronutrients," while noting more specifically that "the availability of Fe, Mn, Cu and Zn under CO2 enrichment increased by 47.7, 22.5, 59.8 and 114.1%, respectively," and that "warming increased the availability of Fe, Cu and Zn by 60.4, 23.8 and 15.3%, respectively," all of which findings bode well for humanity. Figure 1. 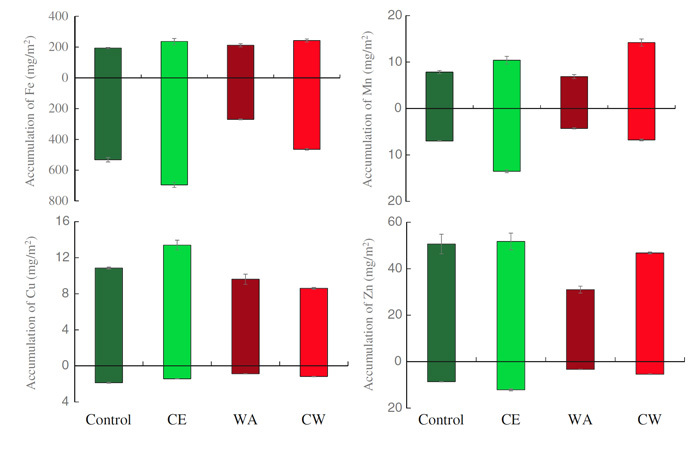 The accumulated uptake of micronutrients (Fe, Mn, Cu, Zn) in shoot (upper) and root (lower) of wheat grown at ripening stage under CO2 enrichment and warming. Source: Wang et al. (2016).